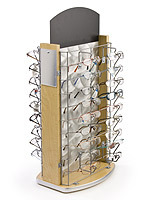 These Sunglass Displays that Present Eyewear are Ideal for Vision Centers! The Small Countertop Design Allows for Placement Near Registers! 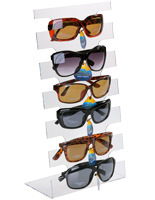 Order Sunglass Displays that are Sold at Discount Prices Online! 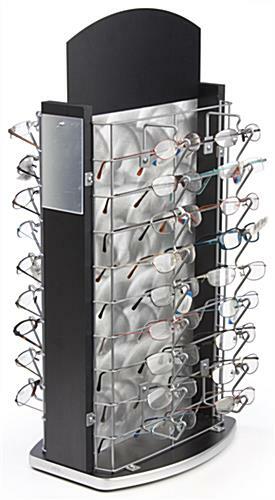 These sunglass displays, sometimes called retail racks for eyewear, are specially designed to accommoate pairs of glasses. Each unit is crafted from thermally fused melamine panelings, which ensures the stands will last. 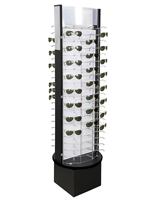 The sunglass displays have a timeless design that is perfect for upscale retail and service locations. 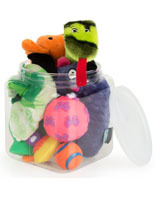 The holders are able to support as many as (36) pairs of glasses at one time. The sunglass displays keep eyewear organized in an easy-to-view vertical layout. In addition, the counter racks each feature a blank, removable black header that can be personalized with an advertisement or message. The attractive sunglass displays are designed to rotate 360 degrees. This way, viewers can easily see and select the glasses they require. 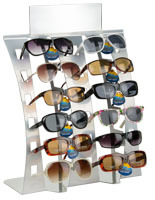 Placing sunglass displays near a jewelry case or cash registers is a surefire way to encourage more sales. 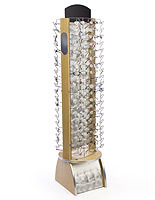 The gorgeous eyewear racks are well equipped with two side mirrors. 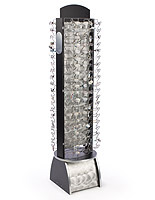 Every customer wants to be able to check out his/her new look before making a purchase from the sunglass displays. These units are also available with a maple finish, as well. The sunglass displays are shipped unassembled and require minor assembly. 14.8" x 30.5" x 13.8"